Let us tell you a little story. There once was a girl who had a tough day at work. She came home feeling down and depressed. She felt like nothing could turn this day around. To make matters worse, her stomach began to growl. Angrily, she walked towards the kitchen and opened the refrigerator. To her dismay, it was empty and sad just like her day. Tears began to well up in her eyes. Suddenly, she remembered this awesome place called Delish Pizza Bar and her big frown turned upside down. So she ordered herself a large pizza which made her realize that sadness is temporary, but pizza is forever. Now this is what we call a happy ending. Beautiful story, right? In all honesty, this is us, most days of our life. Every bad day that we face, is turned around by the heavenly sight of pizza. Not just any pizza, but pizza from Delish Pizza Bar! We are sure that you can relate to this too. Roses are red, violets are blue. This is my pizza, and I’m not sharing it with you! Jokes apart, this is truly the kind of pizza you would want to devour alone because it is THAT good. Once you take a slice, it will be hard for you to put it down. This is the crispiest thin crust pizza you will taste, with an authentic Italian pizza sauce that is prepared especially by the owner himself. Only fresh and organic ingredients are used while preparing the pizza so you won’t feel guilty for putting unhealthy stuff in your system. A myriad of flavours and toppings are available. You can get the Margherita, Vegetarian, Goat Cheese, Cream Cheese, Chicken BBQ, Spinach Alfredo, Sicilian Chicken, Roast Chicken, Hawaian, and many more. Apart from pizza, their beef lasagna is also to die for. It is so rich and creamy, with layers and layers of cheese and white sauce; just thinking about this lasagna makes you salivate. In all seriousness, no need to get in any line. Get your hands on this cheesy pizza while sitting on your couch because Cheetay will get in line for you. 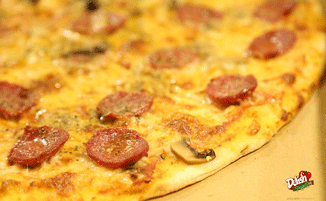 All you have to do is visit Cheetay’s website and order your favourite pizza from Delish Pizza Bar. Alternatively, you can also download the Cheetay app to place your order. After that, all you have to do is wait while our Cheetahs deliver that piping hot pizza to your doorstep.